My exploration of London’s art galleries and exhibitions continues with the BP Walk through British Art exhibition at Tate Britain. 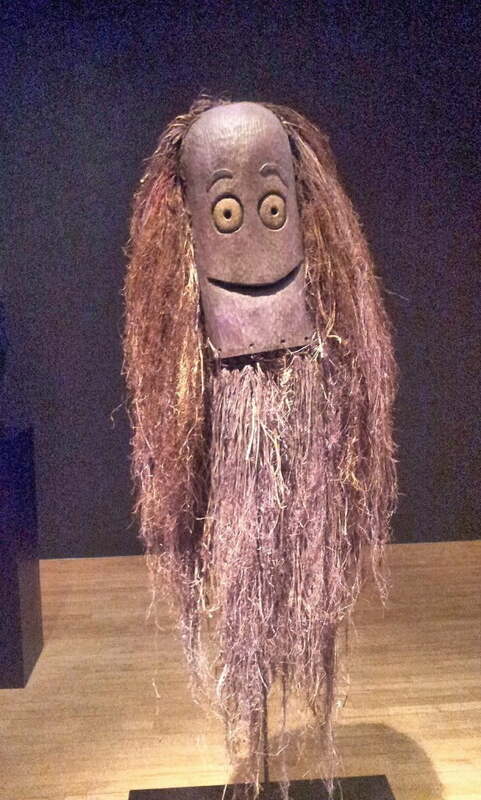 I’ll be honest, I don’t know a whole lot about British art. I could maybe name a handful of British artists before my visit which include the likes of Damien Hirst, Tracey Emin and Grayson Perry; all of which have won the world renowned Turner Prize in the last decade or so. So an overview of the last 500 years of British art seemed like the perfect crash course and beats reading a book about the subject! 18 rooms of various sizes take you on a chronological journey from the 16th century right through to pieces created in the last year or two – to say there’s a lot to get through is an understatement! The gallery allow you to take pictures, which is rather unusual I thought! So here are my favourite pieces of artwork and ones which caught my eye. One of the unexpected highlights of the tour for me personally were the paintings focused on war and conflict through the various centuries. These often large creations on canvas had so much going on in them with, what seemed like, hundreds of bodies included to great detail. 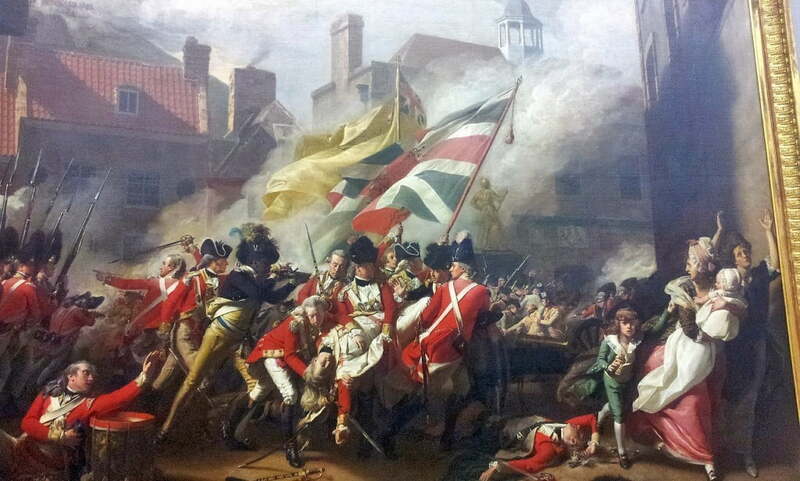 Take John Singleton Copley’s The Death of Major Peirson which portrays the British in battle. It’s a great snapshot of what it would be like in the battlefield with cloud hazing the surroundings, fellow battlers dying or dead and families running for safety. The dynamism of the piece gives the audience the feeling of panic and frantic nature of battle. 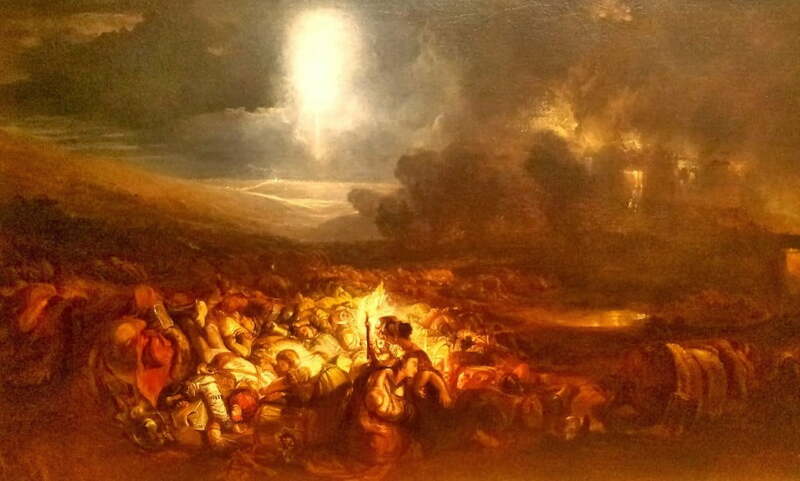 Another piece centring on war which I admire is The Field of Waterloo by J.W Turner. However, this picture takes another stance and depicts a different emotion to many pieces similar in nature to The Death of Major Peirson. While those represent the frenzied feeling of battle, The Field of Waterloo shows the sad aftermath of war. This rather gloomy and stark scene shows bodies on top of bodies lying motionless on the ground, their faces lit up by loved ones searching for their family using a torch. Synonymous of Turner’s style, the dark colours create a sombre mood, helping to emit the feeling of great tragedy which comes with war. Anyone who walks through the exhibition won’t help but notice this rather disturbing piece by Francis Bacon. Another grim and horrific view of war, the triptych represent the shocking exposure of the Nazi concentration camps in the Second World War. While 1945 celebrated peace in Europe, this exposure of ill and starving inmates couldn’t be ignored. The deformed figures perhaps represent the poor treatment they received, almost like they weren’t humans at all, even though the hair, ears and mouth full of teeth suggest otherwise. The bright orange colour of the room to me gives the feeling of heat or perhaps even hell. 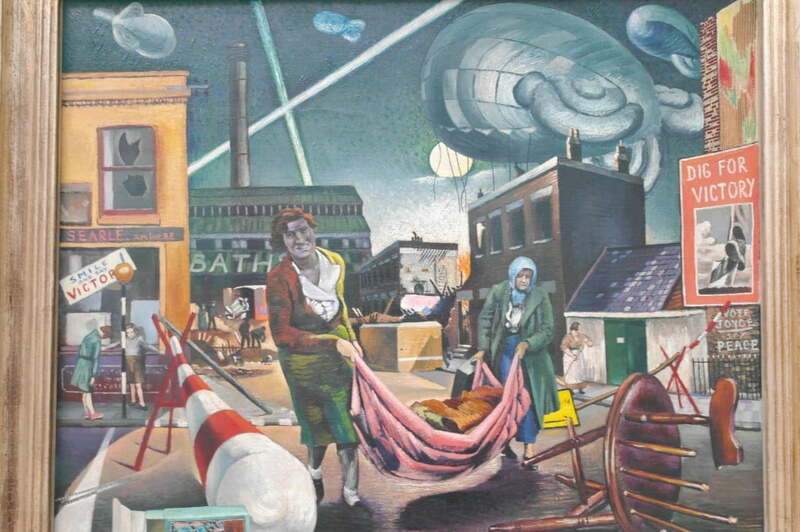 Bombed Woman and Searchlights by Clive Branson is another piece centred on the Second World War. Again, the feeling of chaos is a key theme with broken objects and two women seemingly running away from the scene. To me, it suggests the camaraderie needed to survive during this time. It also represents the role women played; while men fought, women too had to do all they could to survive. However, my first thoughts on seeing this were the laser beams (I realise now they are probably spotlights) splitting the night sky and the huge airships which remind me of Bioshock 3, making me think this was actually set in the future! 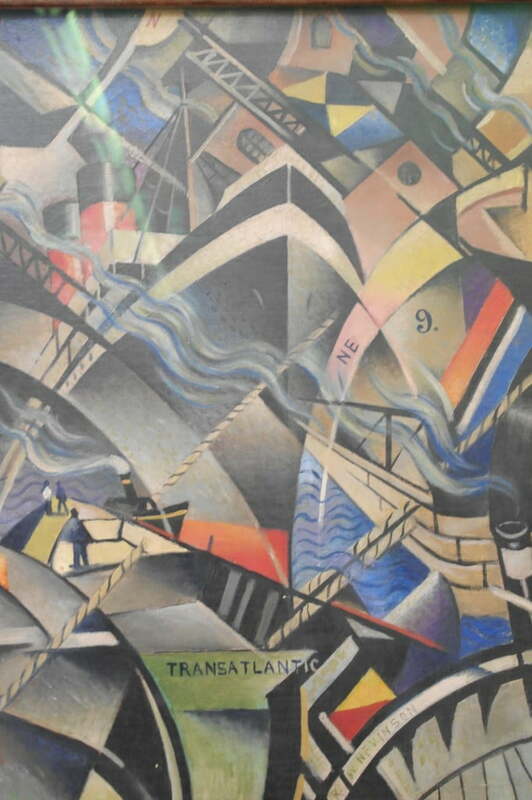 The Arrival by Christopher Richard Wynne Nevinson caught my eye for its mixture of bright colours and overall confusion. Here we see a liner which is distorted and has been broken down. My instant thought is the feeling of looking into a kaleidoscope. There’s just so much to look at my eyes aren’t sure where to start! Blake’s On the Balcony has many themes running through it which you may not pick up on, one of which is balconies in the photographs. Look closer and you can see various shots of The Royal Family on balconies. There are also a number of products and brand names shown such as a packet of Lucky Strike cigarettes, a copy of Life magazine and a ‘I Love Elvis’ badge. This social commentary is similar to the idealisms of Pop Art, suggesting the influx of Americana, commercialism and the rise of the celebrity after the Second World War. The Chapman Family Collection threw me initially! What appeared to be ancient tribal statues on first glance, turned out to be about McDonald’s! Yes, the fast food chain! I thought I saw a hamburger with a face on it, but put that down to hunger. But then I saw this and was sure it was the face of Ronald McDonald – scary stuff! The pieces are suggest the sometimes commercial nature of art. While not strictly part of BP Walk through British Art, I enjoyed Chris Shaw’s exhibition. 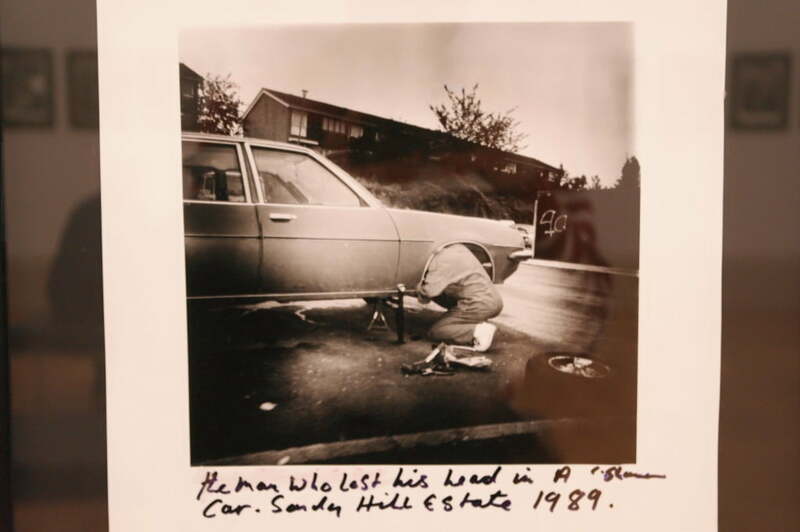 His black and white, almost Polaroid like, photos show everyday life with often humorous captions below such as the man who lost his head in a car. 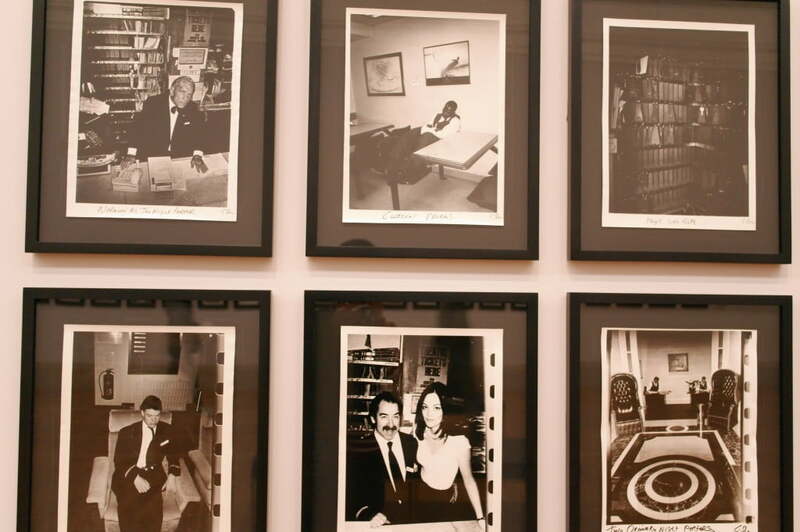 It was his series of photos as a night porter that really endeared me to his style. Here we see pictures of fellow workers and the hotel itself including someone having a nap! There was also the other side of hotels – the guests – who appeared to be having a great night out, including one naked woman. 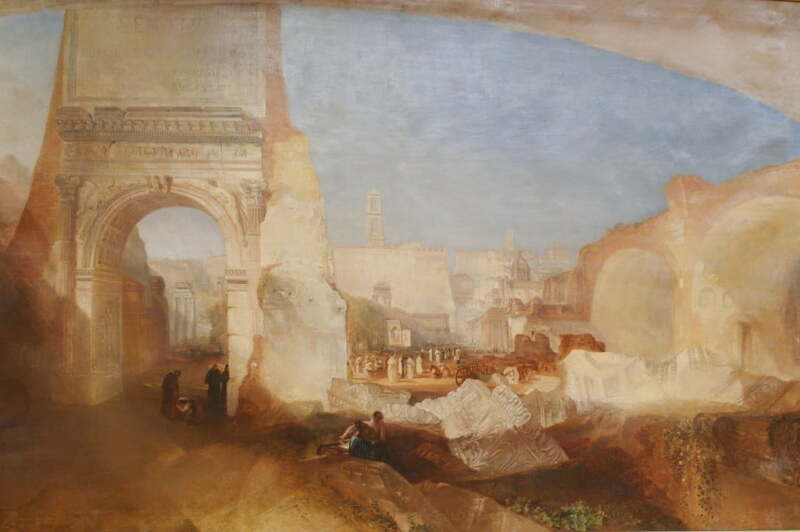 I finished my visit of Tate Britain with an exploration into the career of J.W.Turner. 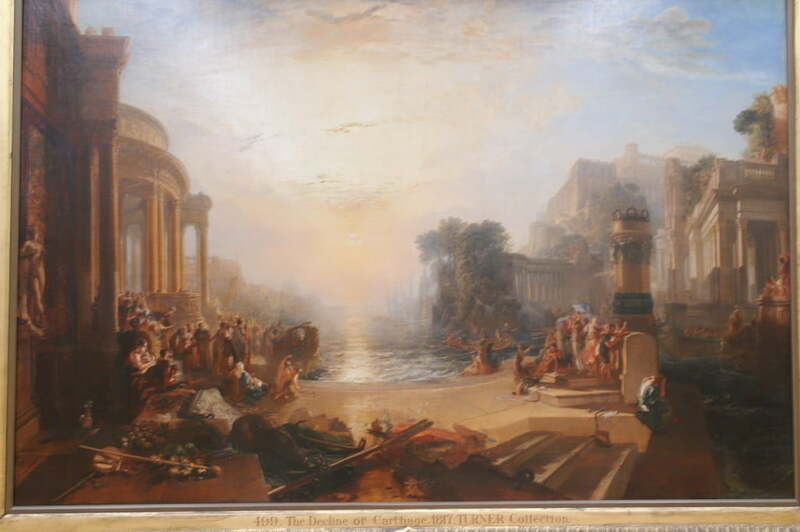 Featuring a number of large and audacious paintings including my favourite’s The Decline of the Carthaginian Empire and Forum Romanum. There are a few free guided tours focusing on the key pieces taking place around lunchtime which I thoroughly recommend. I did a DIY tour and took my time, but I listened for one piece of artwork and the information given added so much to your experience, giving you a greater insight behind the meaning and history of the painting. There are also mobile app guides which give commentary to the key pieces; something I only remembered on the train home but again well worth downloading and using to enhance your experience. I also recommend donating £1 for a map to keep you on the right track, although each room is clearly marked. For those looking to learn more about their new found favourite artists, there are reference books after the last room. I made use of a book by Peter Blake – I didn’t know he designed The Beatles’ infamous Sgt. Pepper and the Lonely Hearts Club album cover! The BP Walk through British Art is a fantastic introductory guide to the last 500 years, giving visitors a clear idea of Britain’s most prolific artists and their work. Have you visited the BP Walk through British Art? What were your favourite pieces? Tell me in the comments section below!